Special 1-2 is the the second level of Special 1 in Super Mario 3D Land. It is based off World 1-2. The level also introduces the Cosmic Clones, who will chase the player through the entire level. The level is laid out similar to World 1-2. The player starts out in a corridor with a Spiny, after jumping up the first platform the Cosmic Clone forms and starts chasing the player. The player must continue through the corridor and will soon reach an area with collapsible rock platforms, should the player fall down then there is a Warp Pipe that will warp the player to the platform before the rocks. The player will then continue through the corridor which contains many Spinies and spike platforms. After that the player will reach the Checkpoint Flag. The player will then continue through the corridor and reach an area filled with Spinies and rolling spikes. The player must then cross a bridge and jump on a trampoline platform, if the player goes to the left they receive a 1-Up Mushroom, if they go to the right then they go to the Warp Pipe which leads to the final area. In the final area there is a Super Star which can be used to destroy the Cosmic Clone. The player was to jump onto an ascending platform to reach the top of the Goal Pole. Star Medal 1: Located on a series of collapsible rock platforms. 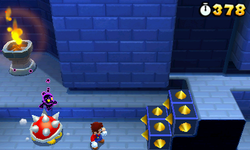 Star Medal 2: In the path of a rolling spike. Star Medal 3: On a trampoline platform over a pit.